NEW YORK (April 27, 2011) – The long, strange journey taken by Maurice “Sugar Moe” Harris finds the USBA heavyweight champion only two fights away from his living his dream to fight for the world title, as he prepares to go back to the future May 27 to participate in an International Boxing Federation (“IBF”) Box-Off against the same opponent he defeated a decade ago in the final of the “Thunderbox Heavyweight Tournament,” former world title challenger Tony “The Tiger” Thompson,” live on ESPN Friday Night Fights from Reno Events Center in Nevada. Harris (24-14-2, 10 KOs) and Thompson are IBF rated No. 8 and No.9, respectively, and the winner of their 12-round May 27 co-feature earns a showdown against the other IBF Box-Off winner, “Fast” Eddie Chambers (36-2, 18 KOs), who defeated Derric Rossey by way of a 12-round unanimous decision this past February to become the IBF No. 1 contender. The Harris-Thompson winner automatically becomes No. 2 and earns a place in an IBF Title Eliminator against Chambers to ultimately determine the IBF mandatory challenger for champion Wladimir Klitschko (or David Haye if he wins their July 2nd unification fight. “It feels good to finally be here,” Harris said from his training camp in New Jersey. “It’s been a long road and now I have a special opportunity against Tony Thompson, who is a great fighter but somebody I have to overcome. I don’t think I have an edge because I beat him in the ‘Thunderbox Tournament’ because that happened a long time ago (2002) and it was only a three-round fight. We were both younger then but we have to do it all over again. The 35-year-old Harris has beaten some of the best but also lost to journeymen playing the role of a classic heavyweight underachiever for most of his up-and-down 18-year pro career. The reborn-Harris, however, is riding high on the crest of a wave that he hopes reaches its zenith with a world title belt wrapped around his waist. After making his pro debut December 4, 1992, losing a four-round decision to Joe Kenna, Harris lost three of his first five fights and was 5-4-2 midway through 1994. 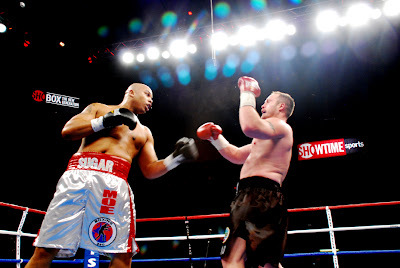 Back-to-back losses via knockouts to world title challengers Vaughn Bean and Dale Brown followed, but Harris bounced back strong with a win by eight-round decision versus previously unbeaten David Izon18-0) to start 1996. When Harris stopped Jimmy Thunder (32-7) in the seventh round of their 1997 fight, Maurice was chosen as the opponent come-backing former world champion Larry Holmes, who won a 10-round split decision that most observers felt Maurice should have been awarded. The resilient Harris, however, reeled-off seven straight victories, including a 10-round decision against world title challenger Jeremy Williams in 1999 on only a five-day notice. Harris eventually gained the experience he lacked with no amateur background to speak of when he later sparred with world champions Lennox Lewis and Mike Tyson. Harris lost to another world title challenger, Derrick Jefferson, in one of 1999’s best and most entertaining fights, but Maurice became more inactive from that point on, winning his only two fights in 2000, and losing his 2001 showdowns to former and future world champions, Chris Byrd and Henry Akinwande. 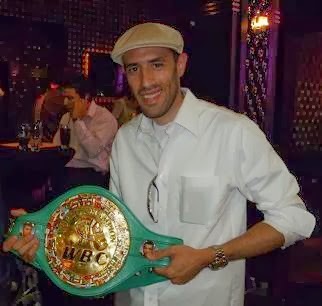 In 2002, Harris knocked out previously unbeaten and future world title-holder Sergei Liakhovich (16-0) in the ninth round, earning him a spot in that November’s “Thunderbox” tournament, in which he captured the $100,000 winner’s purse by out-pointing Gerald Nobles, Israel Garcia and Thompson in the finale, fighting three-round bouts on the same evening. After being stopped in the 10th round by Fres Oquendo in his first fight after upsetting Liakhovich, Harris found himself frustrated and on the shelf by his promoter Don King, fighting only four times in six years, idle for all of 2008 and 2009, until Maurice signed a promotional contract in late 2009 with Boxing 360. His first fight with his new promoter was a win by 6-round unanimous decision January 29, 2010 against Billy Zumbrun (23-10-1) in Albuquerque. Harris went on to win six and eight round decisions, respectively, against 7-foot Julius Long and Robert Harris, setting the stage for his August 6, 2010 USBA title shot against a Nagy Aguilera, who was 10 years younger than Maurice and had defeated former world champion Oleg Maskaev only a five months earlier. Harris out-boxed Aquilera (16-3) by scores of 117-111, 117-111 and 115-113 for a unanimous 10-round decision and the USBA crown. NY State super middleweight title-holders, middleweight Lennox “2 Sharpe” Allen and welterweight Danny Sostre, KO king Tyrone Brunson, Nick “Hands of Gold” Casal, Amanda “The Real Deal” Serrano, middleweight prospect DonYil Livingston, Joshua “The Juice” Harris, Emad Ali, Angel “Toro” Hernandez and “King” David Estrada.